This topic contains 1 reply, has 2 voices, and was last updated by Stefano 4 months, 3 weeks ago. I’d love to be able to create a custom field where I can add more to a particular post to add to the base rate. Or be able to create a set of tiers for base rates. For example, Tier 1 is $40, Tier 2 is $80, and so on. So that I can have categories of posts, basically. Is that something the plugin can do currently and I’m just missing it, or is that something an add-on does? This is already possible! 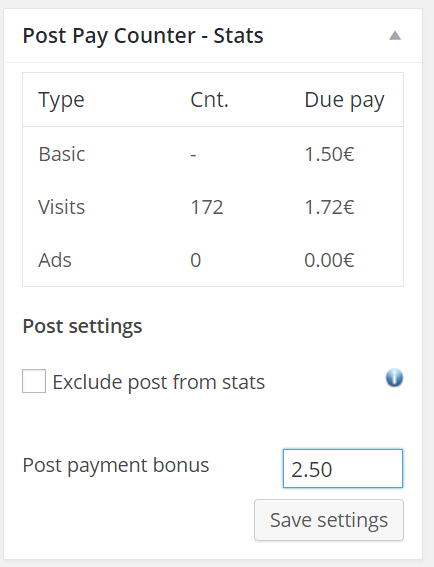 In fact, you can award a custom bonus to any post through the Post Pay Counter Stats box in the post edit page. You just need to make sure the related feature is on in the Miscellanea box and that you have permission to award the bonus (see Permissions box). The topic ‘Custom add-on field per-post or base rate tiers’ is closed to new replies.